Aurora de Ivory is a woman of middle age, still young enough to catch the eye yet of enough years to know better. She is an artisan merchant and cleric. Her greatest magic is in creating items of power, a hat that heals or brings joy or a necklace that brings luck or love. She loves to travel around in her caravan wagon creating and selling her works and sowing the seeds of positive magic wherever she goes. Aurora was left alone in the world just as her magic began to reveal itself. In order to make a living Aurora depended on her skills as an artisan. Soon she found that as she made things, they held simple powers. First was healing, as she threaded a charm she had made on a brightly colored ribbon and placed it round the neck of a sick child. Immediately the dullness went out of the child’s eyes. Before Aurora left town a few days later the little girl was up and walking. The following year the little girl was no different from the other children her age. The first year that Aurora was on the road was the hardest and the leanest. Materials were hard to come by and many times the decision to buy food or raw materials had to be made. Though it always seemed somehow there was just enough to keep going. The seeds of weaving magic into things that Aurora had made were sown. She began honing her craft as she had done when she began mastering each of her other skills. One day the Burger of the town came to Aurora’s wagon and looked over her wears. Seeing nothing to his liking he demanded she create this type pin in another color and best she have it ready tomorrow at this time and for half the price or be on her way out of town. Aurora spent the evening and into the night fulfilling the Burger’s order. Angry and upset she finished the order and fell into bed. The next day when the pin was neatly fixed on the man’s coat and the silver was safely in Aurora’s pouch, he fell over dead as walked across the town’s square. Aurora learned of the double edged nature of magic. This side of her magic had to be mastered as well for only through mastery comes control. As a young girl Aurora was taught to hunt with a bow. And the skills of bowery and fletching are included in her skills. As with her all her arts magic can be woven into the items she creates. The darker side of magic was well suited to these arts and through them Aurora was able to travel the roadways safely and never go hungry. And if you are very convincing and you cause is just Aurora might create for you a bow of great power with arrows that can do amazing things, items of protection and sight. And yet, if your cause truly inspires her, she may go adventuring with you. In 1998 I began attending parties regularly assisting with set-up or clean-up at least 3 times a year. I also provided food and donations at every party I attended. This continues to the present. I built the Pearly Gates and the Dance Cages for the Heaven and Hell Party. And over the years I have provided tables and ambiance items for use at parties, set them up took them down and hauled them off. Volunteered as on-site staff member in the Dealers Room assisting Wilgar and Lori Wright at Darkcon 200? and 2007. Assisted Joann(?) with the set-up of the Dealers Room at Darkcon 2010. 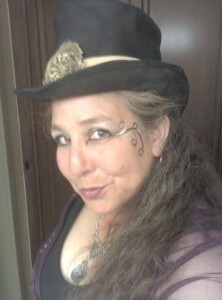 I fulfilled the position of Merchant Liaison for Darkcon 2012 and I am presently the Merchant Liaison for Darkcon 2014. I have volunteered to be the seller of Darkcon SWAG at house parties, promo parties and at Darkcon 2007, 2010 and 2012. I am slated to be the Historian for the Dead Man’s Party 2013 (The Spanish Inquisition). I would like to perform this duty as a DOA instead of as a shadow behind another member. Over the years I have lent a hand wherever it was needed, money when I had it, prizes for parties and Darkcons, constructed stuff or loaned equipment and supported the group with food at every party I’ve attended. I plan to continue to support this group in the same way I always have whether the voting status of DOA is forthcoming or not.